NAIROBI (Reuters) - Somali pirates are suspected of hijacking a Sri Lankan-flagged fuel freighter that sent a distress call, turned off its tracking system and altered course for the Somali coast, a piracy expert said on Tuesday. If confirmed, Monday's incident would be the first hijack of a commercial ship by Somali pirates since 2012. 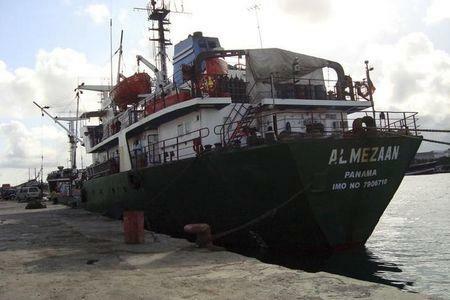 The Aris 13 was believed to be carrying eight crew, said John Steed of the aid group Oceans Beyond Piracy. Steed, a former British colonel, has worked on piracy for nearly a decade and is in close contact with naval forces tracking the ship. "The ship reported it was being followed by two skiffs yesterday afternoon. Then it disappeared," he told Reuters. Aircraft from regional naval force EU Navfor were flying overhead to track the ship's progress and try to determine what was happening, he said. The 1,800 deadweight tonne Aris 13 is owned by Panama company Armi Shipping and managed by Aurora Ship Management in the United Arab Emirates, according to the Equasis shipping data website, managed by the French transport ministry. The ship was being monitored by the United Kingdom Maritime Trade Organisation (UKMTO), which coordinates the management of all merchant ships and yachts in the Gulf of Aden area, said Noel Choong, head of the International Maritime Bureau’s piracy reporting centre in Kuala Lumpur. The UKMTO in Dubai said it had no further information "at the moment". The ship was headed for the Somali port of Alula, Steed said. Pirates in the town confirmed to Reuters they were expecting the ship. That year, Ocean's Beyond Piracy estimated the global cost of piracy was around $7 billion. The shipping industry bore around 80 percent of those costs, the aid group's analysis showed. Intervention by regional naval forces that flooded into the area helped disrupt several hijack bids and secure the strategic trade route that leads through the Suez Canal and links the oilfields of the Middle East with European ports.